Located in south-central Hendry County approximately 40 miles east of Naples, the Panther Glades Florida Forever BOT Project exists in a landscape far removed from the bustling coast. This is hammock land, pasture and cropland. The paved roads hum with fruit trucks and old school buses carrying migrant farmworkers to and from the fields. At a dusty gas station general store off of S.R. 29 customers with debit cards must wait until the phone is unoccupied before their transaction can be run. Outside of the Greater Everglades public conservation land complex of Collier, Monroe, Miami-Dade and Broward counties, agriculture dominates south-central Florida. Rich soil and a long growing season make this among the most valuable agricultural land in the United States. Sugar cane accounts for much of it, but there are also fruit and vegetable growing operations, like watermelon, broccoli, and citrus. Cattle ranches account for much of the remaining forested habitat. The Panther Glades Project begins at the Collier/Hendry line, where it abuts the Big Cypress National Preserve. From the cypress domes and pop ash swamps of southern Hendry County the project stretches north, through a mosaic of forested hammocks and improved pasture. The project is large, stretching approximately 19 miles south to north, and at it’s widest, 9 miles east to west, totaling 64,800 acres. Over 24,000 acres are currently protected, primarily through Florida Fish and Wildlife Conservation Commission management of Dinner Island Wildlife Management Area near Devil’s Garden, in the northern half. The U.S. Fish and Wildlife Service manages the 1900-acre Florida Panther Conservation Bank, located within the project. Twenty miles northwest of Panther Glades is Okaloacoochee (OK) Slough State Forest. OK Slough represents the northernmost extent of the female panther’s range. While the male panther has been documented dispersing north across the Caloosahatchee River into the ranchlands of Glades and Highlands counties, the population of breeding females remains south of the river, where panther d and territorial battles with other cats. For many years, panther experts have recognized that only the expansion of panther range beyond the Caloosahatchee is likely to ultimately save the population. 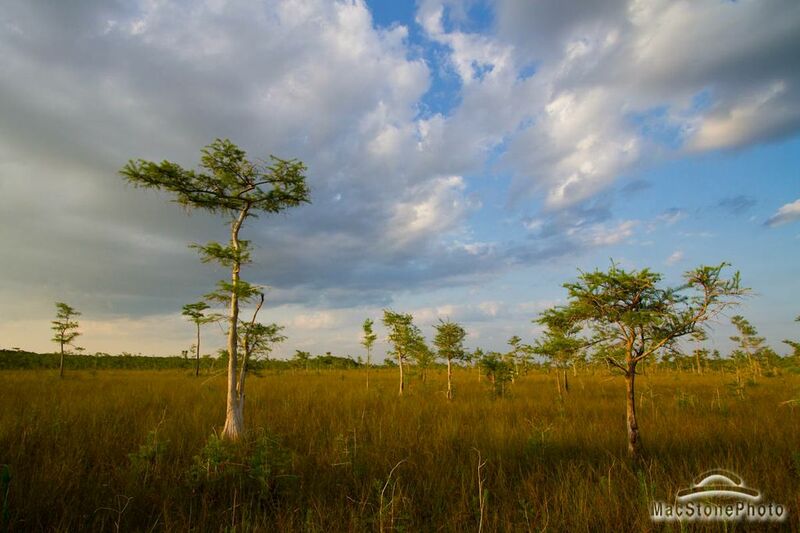 The Panther Glades project would ensure a large landscape of mostly contiguous forested land, connecting the big cats’ stronghold of the southwest Florida and the Big Cypress Addition Lands (aka the Save Our Everglades Florida Forever BOT project) to the OK Slough conservation complex. Long-term telemetry monitoring by FFWCC biologist shows that there are already panthers, including females, throughout southern Hendry County. Though the route through the project includes some cane lands, telemetry data indicates that the landscape is permeable to panthers. The project overlays one paved road, County Road 846, which skirts the southern end of Dinner Island WMA. The mosaic of habitat supports good numbers of whitetail deer and feral hog, two of the staples of the panther diet. There are other large area-requiring species, most notably the black bear and the swallow-tailed kite. A menagerie of wading bird species roost in the cypress domes and forage in the wet meadows. Nevertheless, the landscape is in south Florida, in mostly private ownership, and is thus vulnerable to being converted to a more intensive human use. The mix of properties within the project boundaries will require an approach that mixes conservation easement agreements and fee simple acquisition. Some portions of the uplands will require restoration and implementation of prescribed fire. Armed with the knowledge of panther movement habits and habitat preferences, biologists and conservationists are pursuing a long view strategy for expanding the panther population beyond south Florida; if we protect and manage habitat so as to allow the panther population to push north on its own, eventually the female panthers will find their way across the river on their own. Securing the connections between conservation complexes along the likeliest routes north is an essential facet of this strategy. With Florida Forever funding and the good stewardship of landowners and agency professionals it is still a very reachable goal.